The January 2015 issue of Reader’s Digest (India Edition) reached us almost quite on time. Here are our views about the issue. The blue-white-grey-black theme cover page looks decent. 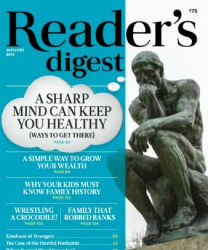 The thinker’s statue make the cover page even more attractive. The editorial this time is not great but it surely is emotional. The article which talks about the kindness of the strangers show how fortunate we are that there are humans with golden heart still lives amongst us. They prove that you can help if you wish. And you don’t need to be very wealthy or at great position to do so. All you need is a will to do good. By reading the incident where a lady and her daughter in rickshaw met with an accident, helped by “hijra”s, you will surely think that aren’t they really blessed with what we called as “manhood”! Blind IAS officer has vision for aspirants. Blindness no bar for Ajit’s vision of a career in the IAS. This blind man fought for 3 yrs to become an IAS officer. Being obsessive and compulsive – is a very thoughtful article in the arena of psychology. It also reclaims the fact that people often avoid taking psychiatric treatments when it is needed. May be they feel ashamed to be considered as mentally unstable. But consulting a psychiatrist is not a shameful thing, it is like consulting a doctor for your any other medical need. We, as a society need to change our attitude towards such fact. And we must have to remember that “only a healthy mind can lead to a healthy body and thus the healthy society”. See the world differently – shows fantastic images from Lake Michigan when it was covered with fog. You shouldn’t miss it. How to keep resolutions – talks about the basic realistic rules or rather we say norms about the topic. With every new starting year we tend to take some resolutions and often we end up in not following what we have planned. Keeping this basic yet effective facts checked will definitely help in raising the success rate. But you have to be the ultimate decider that what will work for you and what will not. Because each of us is a different individual living in a different situation and perspective. A good article to go for. A tradition to note – is a small emotional article. A simple way to save – gives basic money saving tips. The article about 3D printing is a good reading material, but it is quite small. It is the “happening thing” and we expect a detailed article about the same in Reader’s Digest (future issues) 🙂 . A new way of thinking – also fall in psychological domain. The article is quite detailed. Same way you will find an article about “parkinson’s” decease. Often we don’t read health oriented article unless we feel a need of it, generally. These articles are good reason to break that tradition. Saved – is a real life drama which is kind of “unbelievable”. It was about a father-son duo, where the son follows his father but it ended up wrongly for him as he found two crocodiles waiting to eat him! How he was “saved” is the thrilling content of the article which is nicely written. Last flight of the little prince – is a Reader’s Digest Classic tale. Rudolph Chelminski’s writing looks fresh even after many years. The mess at the top of the world – is an eye-opener article about how we are dirtying the natural beauties. We love to leave our souvenirs wherever we go; there is nothing wrong in it if it is not the dirt or junk. Nowadays it is tough to find a tourist destination which is free of plastics and other such items. Let us of that the “clean India” movement will start showing its reflection as soon as possible and it will spread over the world. We will be living in the “better world” then. You shouldn’t miss this article for sure. Especially the photos telling the story that what we have done to the nature will disturb you. We often heard about criminal syndicates or gangs. But usually it is seen in films that there is entire family which is treating such things as a “family business”. An article titled “the family that Robbed Banks” thus grab our attention to see whether it is happening in real life also. An article which looks like a crime thriller fiction. The stories that bind us – is about the family. When it is rare these days to see the entire family eating together, living together, such stories matter a lot. Book bonus – gives you another real life drama. It is from a book named Hostages: kidnapped on the high seas. The tale explored in this issue is about Linda and Rupert who was kidnapped. It is something you got to read to believe. This issue is more focused on the psychological stuff. It has more real life dramas and of course there are jokes and humour stuff too. Almost a balanced issue which is worth the price (and time you spend to read it). Our personal verdict: you should go for it.